Toyobo was founded in 1882 as a textile company, when it began its spinning and textile business. We continued to adapt to the changing needs of the times, drawing on our core technologies in polymerization, modification, processing and biotechnology to expand our business fields and develop the kind of high-performance products. 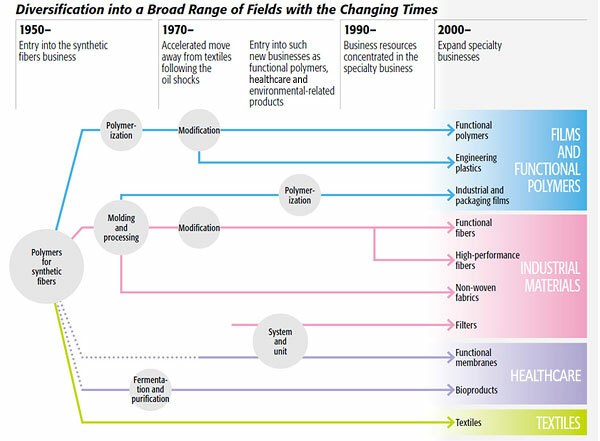 These product lines have been organized into three specialty business segments—Films and Functional Polymers, Industrial Materials, and Healthcare—in which we are prioritizing growth and expansion. We have further identified “priority businesses” within these specialty businesses in which Toyobo has a particular strength, and which we hope to nurture and develop into a core business. To accomplish this, we are concentrating business resources in order to accelerate growth. We also actively pursue business alliances and/or technology injections to further enhance already strong businesses. The Toyobo Group seeks to become a manufacturer of high-function products, continuously creating new value by enhancing our core technologies. * Trademarks in this page are registered in Japan.